December 15, 2016 /3BL Media/ - DuPont Industrial Biosciences (DuPont) and Archer Daniels Midland Company (ADM) have been honored with the Breakthrough Solution of the Year Award from Platts Global Energy for their platform technology to produce a revolutionary biobased monomer, furan dicarboxylic methyl ester (FDME). The award was announced at the 18thPlatts Global Energy Awards, held in New York on Thursday, Dec. 8. 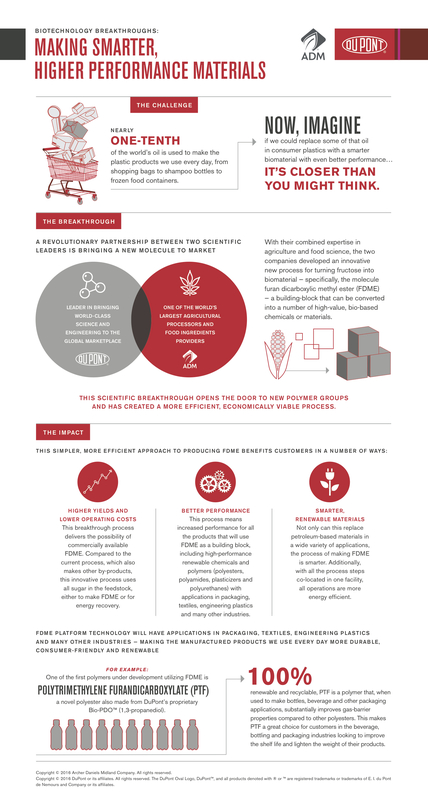 The breakthrough process developed by DuPont and ADM, announced earlier this year, has the potential to expand the materials landscape in the 21stcentury with exciting and truly novel, high-performance renewable materials. The technology has applications in packaging, textiles, engineering plastics and many other industries. DuPont and ADM were selected as Breakthrough Solution of the Year winners out of a field of eight other finalists. FDME is a high-purity derivative offurandicarboxylic acid (FDCA), one of the 12 building blocks identified by the U.S. Department of Energy that can be converted into a number of high-value, bio-based chemicals and materials that can deliver high performance in a variety of applications. The two companies’ new FDME technology, which starts with fructose from corn, is a more efficient and simple process than traditional conversion approaches and results in higher yields, lower energy usage and lower capital expenditures. Until this year, it had long been sought-after and researched, but had not yet been available at commercial scale and at reasonable cost. ADM and DuPont have taken the initial step in the process of bringing FDME to market by moving forward on the scale-up phase of the project. An integrated 60 ton-per-year demonstration plant is currently under construction in Decatur, Ill., and is expected to begin operations in the second half of 2017. The facility will provide potential customers with sufficient product quantities for testing and research as well as the required basic data for a planned commercial-scale plant. One of the first polymers under development utilizing FDME ispolytrimethylene furandicarboxylate (PTF), a novel polyester also made with DuPont’s proprietary Bio-PDO™(1,3-propanediol). PTF is a 100-percent renewable and recyclable polymer that, when used to make bottles and other beverage packages, substantially improves gas-barrier properties compared to other polyesters. This makes PTF a great choice for customers in the beverage packaging industry looking to improve the shelf life of their products. DuPont Industrial Biosciences works with customers across a wide range of industries to make products and industrial processes more efficient and sustainable. Through a unique combination of agriculture, biotechnology, chemistry and material science capabilities, we advance market-driven, biobased solutions to meet the needs of a growing population, while protecting our environment for future generations. For updates about how DuPont Industrial Biosciences is helping customers deliver cost-effective products with superior performance and sustainability, follow @DuPontBiobased on Twitter or visit our website at http://biosciences.dupont.com/. Forward-Looking Statements:This communication contains “forward-looking statements” within the meaning of the federal securities laws, including Section 27A of the Securities Act of 1933, as amended, and Section 21E of the Securities Exchange Act of 1934, as amended. In this context, forward-looking statements often address expected future business and financial performance and financial condition, and often contain words such as “expect,” “anticipate,” “intend,” “plan,” “believe,” “seek,” “see,” “will,” “would,” “target,” similar expressions, and variations or negatives of these words. Forward-looking statements by their nature address matters that are, to different degrees, uncertain, such as statements about the consummation of the proposed transaction and the anticipated benefits thereof. Forward-looking statements are not guarantees of future performance and are based on certain assumptions and expectations of future events which may not be realized. Forward-looking statements also involve risks and uncertainties, many of which are beyond the company’s control. Some of the important factors that could cause the company’s actual results to differ materially from those projected in any such forward-looking statements are: fluctuations in energy and raw material prices; failure to develop and market new products and optimally manage product life cycles; ability to respond to market acceptance, rules, regulations and policies affecting products based on biotechnology and, in general, for products for the agriculture industry; outcome of significant litigation and environmental matters, including realization of associated indemnification assets, if any; failure to appropriately manage process safety and product stewardship issues; changes in laws and regulations or political conditions; global economic and capital markets conditions, such as inflation, interest and currency exchange rates; business or supply disruptions; security threats, such as acts of sabotage, terrorism or war, natural disasters and weather events and patterns which could affect demand as well as availability of products for the agriculture industry; ability to protect and enforce the company’s intellectual property rights; successful integration of acquired businesses and separation of underperforming or non-strategic assets or businesses; and risks related to the agreement entered on December 11, 2015, with The Dow Chemical Company pursuant to which the companies have agreed to effect an all-stock merger of equals, including the completion of the proposed transaction on anticipated terms and timing, the ability to fully and timely realize the expected benefits of the proposed transaction and risks related to the intended business separations contemplated to occur after the completion of the proposed transaction. The company undertakes no duty to publicly revise or update any forward-looking statements as a result of future developments, or new information or otherwise, should circumstances change, except as otherwise required by securities and other applicable laws. The DuPont Oval logo, DuPont™ and all products, unless otherwise noted, denoted with ™,℠or ® are trademarks or registered trademarks of E.I. du Pont de Nemours and Company or its affiliates. The ADM logo and ADM are trademarks or registered trademarks of Archer Daniels Midland Company.